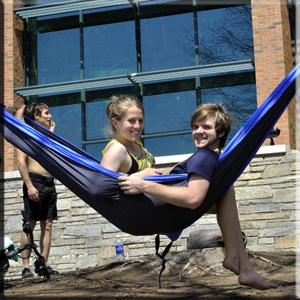 There are so many ways for students to get involved here at Appalachian State University. We believe that a successful student needs to be well versed inside and outside of the classroom. The Lee H. McCaskey Center for Student Involvement and Leadership (CSIL) is a wonderful place for your student to gain resources on how to get involved with clubs and organizations. Here at ASU we have more than 250 clubs and organizations for your student to join and experience the out of class learning to be that well-rounded individual they desire to become in this day and age. If they feel as though the club and or organization is just not there, they can create one with the help of CSIL staff member. The CSIL also offers Leadership Development programs to enhance our students leadership abilities while they are here at Appalachian and beyond. To learn more about the Lee H. McCaskey Center for Student Involvement at their web site. The Office of Parent and Family Services are happy to help answer any questions you may have in regards to how your student can obtain services at the Counseling Center here on ASUs campus. The Counseling Center offers the opportunity for all currently-enrolled students to meet with a counselor to determine the most appropriate course of treatment, at no charge. At the conclusion of this interview, the clinician will recommend appropriate services. These services may be on campus in the Counseling Center, elsewhere on campus (e.g., Wellness Center, Health Center, Learning Assistance Program, Disability Services, Psychology Clinic, Career Development Center), or a referral to the community. Services available within the Counseling Center include individual counseling, group therapy, couples and family counseling, and the opportunity for outreach and consultation. We also offer a variety of services through the Peer Career Center. For a description of each of these services, clinic hours and other counseling center services please visit the Counseling Center web site. They will always need that special encouragement from their loved ones-even when they dont act like it. They are going through several transitions and sometimes cannot express those feelings verbally. When they contact you, please try and make time to listen or respond accordingly. Even if it sounds absurd, be patient; they obviously called to hear your voice or least they wanted you to hear theirs. If the communication comes in way of a text (and you know how) respond as quickly as you can with neutral words trying not to agree or disagree. Ask questions back to them to show your interest even if you are not interested. DONT BE JUDGEMENTAL! If you are close enough to plan a visit, try to attend Family Weekend if at all possible. Take pride in their school. Suggest that they plan the activities for the weekend. They are adults now, treat them like one. During your visit, make or buy their favorite dessert if at all possible. If you cannot visit, a care package says a thousand words. During this time, you can also ask some of those questions about classes, friends, etc. You will need to gauge if you need to back off of the questions by the reactions you receive. Remember that communication is key in any relationship. Tell your child or family member this over and over. Let them know that you are there for them no matter what time day or night-if you truly feel this way. Appalachian State University has an Office of Disability Services to assist eligible students with documented disabilities by determining and coordinating reasonable academic accommodations. This office is very visible on campus and will explain to students and parents what type of documentation is need and required for assistance. To learn more about this office, specific documentation and services, please visit the Office of Disability Services web site.